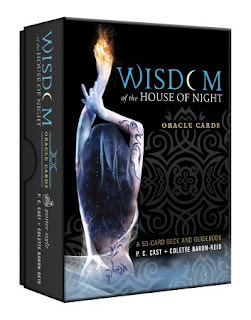 Random House's summary: For the fans of the best-selling House of Night series, the Wisdom of the House of Night Oracle Cards provides a unique interactive experience with the vampyre Goddess Nyx. Packaged in a keepsake box with a guidebook, the deck contains fifty gorgeously illustrated cards, many of which are based on characters in the books. This is a picture of my cards. My review: This is my first time officially reviewing something other than an actual book or an audio book on my blog! When I was first asked by Random House to review these Oracle Cards, I was immediately intrigued by their request. Mostly, because the only memorabilia I’ve ever collected was Harry Potter memorabilia. I’ve also never been big with Tarot cards, but I’ve always thought they were pretty cool. And, even though I’ve never been a true believer of things like fortune telling, I’ve always thought it’d be fun to see what a deck of cards or a palm reader might tell me about myself and my future. Personally, one of the best things about this deck of Oracle Cards is the illustrations. I’ve read the first nine books of the House of Night series (I haven’t read the most recent two), and it’s been fun seeing the illustrations of the characters in the book. So, if you are a big fan of the House of Night series, this should be something you might consider buying. The cards are only $12.95 and I believe that, right now, Amazon has them on sale for only $10.36. I was actually quite surprised when I first saw this price! With the quality of the box and the quality of the deck of 50 cards and the little guide book, I was sure that it would cost no less than $20. And, even at $20, I think this would still be a worthwhile cost for this memorabilia. You are probably wondering if I’ve played with the cards, and that would be a “Yes!” I’ve used the cards to answer some silly questions by my nephews, my son and a couple of my co-workers, and it was quite fun figuring out the meaning to the cards. There was only one minor thing that bugged me about these cards. In the beginning of the guide book it pretty much describes that you are to pretend that you have been selected to be a fledgling in the House of Night, and it actually tells you to pray to the goddess “Nyx.” Well, in the House of Night series, the goddess Nyx is a god over a bunch of vampyres in the House of Night world, and I would hate to see this become a silly teen obsession where they actually start praying to this vampyre goddess and start believing in these cards. Other than that, I thought these were a lot of fun! The illustrations are fabulous! And I’m shocked by how many of the character illustrations on the cards were very similar to the characters I created in my mind even though some were completely different. 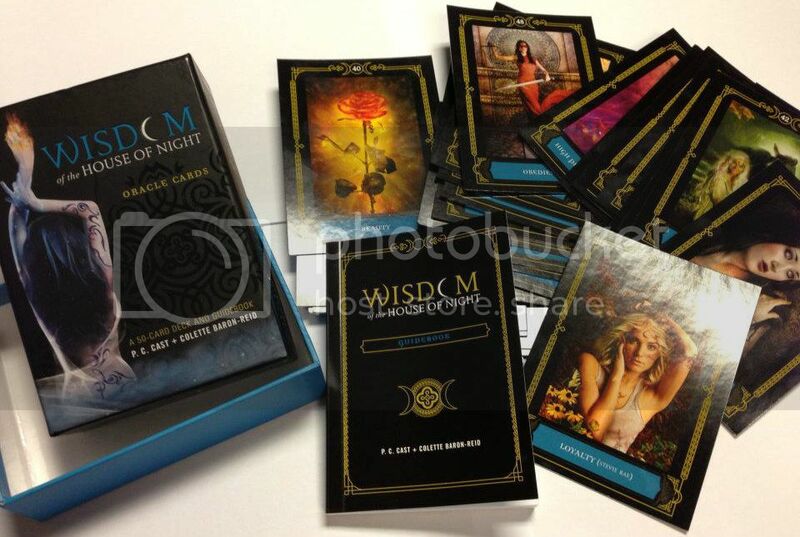 If you are a fan of the House of Night series, you should definitely consider getting yourself these Oracle Cards. Oh my. They look lovely!! I love these cards. They look amazing. I must have them. I actually have this in my wish list at amazon, saw it listed when it first came out. I really want them, they look pretty sweet! Those are gorgeous!! I think that they sound really awesome too. The illustrations look very well done.